The designers at LJ’s Kitchens & Interiors specialize at making your dream space come true. From antique to modern styles, our designers create the perfect kitchen, bathroom, bar, entertainment area, hutch or master closet. If you can dream it, the designers at LJ’s Kitchen & Interiors can build it! We are centrally located in Mount Pleasant, MI but have worked with clients all over the state of Michigan. Our designers enjoy working with a wide variety of homes in different landscapes and regions of the state. From Michigan’s Upper Peninsula to the southern reaches, and from the shores of Lake Michigan to Lake Huron, our desire remains to create a beautiful interior space that you will love. A family-owned and operated company, LJ’s Kitchen and Interiors has been part of the Mount Pleasant community for over 40 years. With more than 75 combined years of experience between our design staff, we have the knowledge and artistry to design and implement any customer’s dream kitchen, bathroom, master closet or leisure space. Our design and interior work has been feature in both regional and national home magazines and websites, and also in many industry manufacturer catalogues. Our showroom is designed to stimulate your imagination. Run your hands across the smoothness of quartz counter tops and admire the natural beauty of granite. Visualize your dream kitchen while browsing the incredible selection of cabinets, countertops and kitchen and bath accessories. The first step to creating your dream space is calling (989) 762-2378 and scheduling an appointment with one of our professional and experienced interior designers. Robert Gurski has 21 years of experience in interior design and has worked with LJ’s Kitchens & Interiors for over 17 years. Robert earned a bachelor degree in interior design and an architectural minor in art and art history from Central Michigan University. His favorite part of the design process is working 1-on-1 with clients to solve a problem with their current space. One of Robert’s kitchen designs was featured on the DURASUPREME Cabinetry blog in 2014. See how Rob solved the problem of too little space for entertaining by reading the blog post. 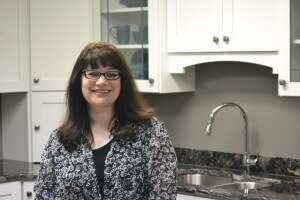 Karen Langell has been with LJ’s Kitchens & Interiors since 1993. She earned a bachelor degree in interior design from Central Michigan University and prides herself in being versed in all aspects of kitchen, bath and closet designs. Her favorite part of the process is taking a customer’s explanation and imagining the actual space into design software. Seeing her client’s face light up when showing different mock-ups is very rewarding to Karen as well. Karen is a member of the National Kitchen and Bath Association and the Home Builders Association of Central Michigan. 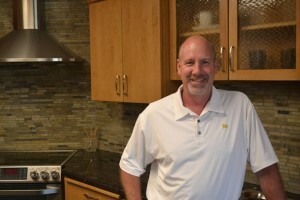 Jim is the newest member to LJ’s Kitchens & Interiors team. He brings to the company more than 35 years of sales experience in a wide variety of industries. 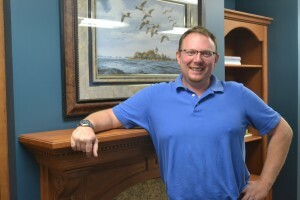 Jim’s focus is on outside sales and he designs and works with contractors. He enjoys being able to work in a creative industry and appreciates how well LJ’s functions with other outside teams or contractors to get the same, perfect end result for every customer. 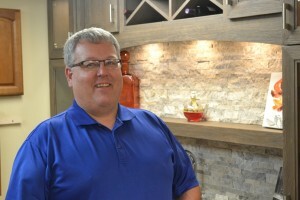 Jim is a member of the National Kitchen and Bath Association and the Home Builders Association of Central Michigan.